For our visitors not familiar with this term, natural stones are harvested from the earth and can be shaped to fit your project. We harvest stones locally when able, we buy local stones when able or we locate the items we need from suppliers. 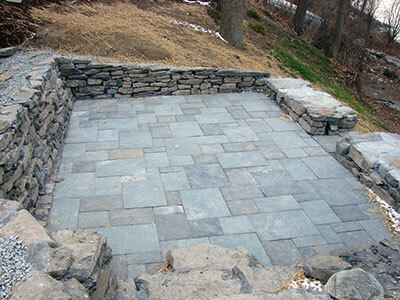 See the link to Vermont Natural Colored Stone for some ideas. Vermont is not only home to organic gemstones like grossular garner, antigorite, and aquamarines, but it’s also home to different locally quarried natural stones. In fact, our state is the largest producer of slates in the USA. Granites and marbles are also widely available. Natural stones do not decompose like woods. That is why they are more ideal for plant beds. Besides lasting forever, they also provide natural nitrogen that is needed for cultivating healthy plants. While concrete eventually breaks, natural stones stay strong amidst all the natural and man-made challenges. No wonder why old buildings like castles and monuments that were built with natural stones lasted for thousands of years. Artificially colored pavers may wash out their hues in time. But natural stones will never decolorize no matter how many acid rain they have to bear. Due to their durability, natural stones will need less and cheaper maintenance. Plus, you’ll get the elegant and stylish finish with the variety of colors, sizes, shapes, and textures that’s possible by combining different natural stones. Among the hardscaping materials, natural stones are the most expensive. Quarrying or harvesting them requires a lot of labor. They also have a fewer supply but higher demand. But the benefits of using a natural stone for the driveway, patio, sidewalks, walk ways, pool decks, and many other areas are all worth the extra spending. Vermont is a proud producer of slates. That is why this is also the most abundant material that we use in our projects. Besides abundance, slates are very flexible and available in myriad of colors, textures, shapes and sizes. When freshly quarried, slates actually have a rough surface and irregular shapes. It is then expertly cut to achieve a smooth finish and fine edges. Cutting is necessary to make sure that every piece will accurately fit and create a flat and functional surface. Otherwise, this natural stone can simply fill in a space and create a rugged surface. The unprocessed slates are also ideal for steps, sidewalks, and walkways. Unlike slates, flagstones are naturally flat and are used for roofing, fences, patios, walkways, and paving slabs. They’re also popular for facades, headstones, memorials, and many other constructions. Travertine is also a popular choice for garden paths and paving patios. They can also be polished into a smooth shiny surface and be used for facades, flooring, and wall cladding. Marble is another popular natural stone for construction. It can be polished and be applied to almost anything—from the ground up to the ceiling. But perhaps the most popular marble application in homes is for the kitchen counter and kitchen island. Granite is another natural stone that is ideal for kitchen countertops. It can also be polished like marble but it is more durable, making it a more popular choice for monuments. 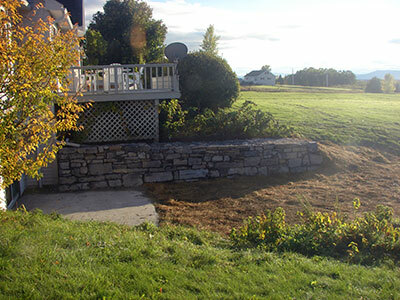 At Rainbow Acres Landscaping, we have access to these natural stones and can install these into your homes or landscapes. These can provide beauty and pride to every residential or commercial space in Vermont. Our goal in every project is to provide you with the highest quality of work that you can be proud of and enjoy forever.